A life-size Lancer replica and an original painting from Bungie are among items IGN will auction next week in a 12-hour "webathon" to raise money for relief efforts in Haiti. The fund raiser will be held beginning at noon U.S. Eastern/9 a.m. Pacific on Wednesday, and includes contributions from industry luminaries moved to help the Caribbean nation in this time of utmost need. Additionally, IGN editors will spend the webathon playing Modern Warfare 2, beginning as level one characters and increasing their donations as they rank up. 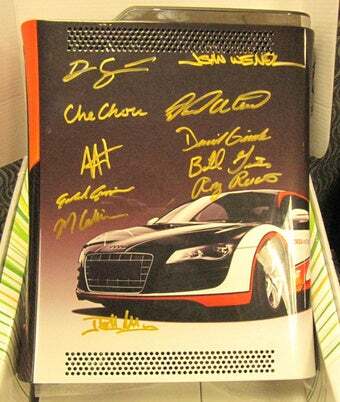 IGN says it has received many donations of items from concerned industry members, including that Forza 3 Xbox 360 autographed by the development team, pictured at left. IGN's donation site will also include links where visitors may donate directly to Habitat for Humanity.